Facebook has initiated a massive purge of independent media content. This blackout includes barring multiple independent media sites from posting links to their own site on their Facebook page, deleting independent media posts without warning or reason, marking independent media posts as spam so ordinary members of the public can't share them, and deleting ordinary people's posts without reason. This issue has impacted multiple left-leaning independent media sites like Another Angry Voice, Evolve Politics, Vox Political, People's Campaign for Corbyn, EU Citizens for an Independent Scotland, and many others. With pages left unable to post links to their own articles. Facebook have tried to dismiss the independent media blackout as a "glitch" but interestingly the Facebook pages of mainstream media outlets were unaffected by the "glitch". 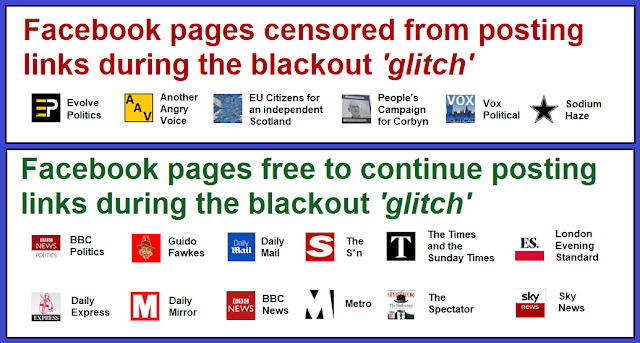 Mainstream media outlets that have been able to continue posting articles throughout the blackout include the Daily Mail, The S*n, Evening Standard, The Times and Sunday Times, The Guardian, The Spectator, Daily Mirror, Daily Express, Sky News, BBC News, and BBC Politics. Additionally the hard-right Guido Fawkes blog was also allowed to continue posting links to their vile echo chamber of hate throughout the Facebook blackout. The fact that a select few pages were allowed to continue posting throughout the Facebook blackout suggests that there's some kind of Facebook 'whitelist' protecting them from whatever measures they've been taking against independent media sources. So a range of left-wing, pro-independence, anti-Tory, pro-Corbyn, anti-fracking independent media pages were barred from sharing links, while mainstream media outlets and hard-right blogs were completely unaffected. Given that the mainstream media is overwhelmingly biased in favour of the Tory party and the permanent Westminster establishment class, and that independent media is often the only place that Labour, the Green Party, the SNP, and Plaid Cymru get a fair hearing, it's deeply concerning that Facebook is capable of basically shutting down independent media's ability to communicate, whilst allowing the mainstream media and hard-right smear-mongering operations like Guido Fawkes to continue posting links. What's even more horrifying is the thought that Facebook could easily launch another independent media blackout like this in the middle of an election period. We all know that super-viral independent media content played a significant role in the Labour surge at the 2017 General Election, so shutting down independent media's ability to communicate during an election period would clearly favour the Tories. It's an extraordinary coincidence that Facebook launched a massive blackout of independent media pages on the very same day that Jeremy Corbyn announced new policies to promote independent media, democratise the BBC and fund it via a social media tax, and provide investigative journalists with much greater Freedom of Information powers. Apparently there are actually no rules whatever to stop Facebook from interfering in British politics in this way, just as there were no rules in place to prevent them from making £millions by undermining democracy by targeting secretive and highly misleading political dark ads at the Facebook users deemed most liable to fall for them (during the EU referendum in 2016, and for the Tory party at the 2017 General Election). Facebook have so many users that they've developed an ability to dramatically influence political discourse, from extremely positive aspects like allowing non-corporate writers, investigators, and journalists a means of promoting their work, to extremely negative aspects like targeted dark ads and independent media blackouts. Either the British electoral authorities step in with new rules to ensure that Facebook provide a fair and level playing field (especially during election periods), or things will almost certainly get a lot worse. Perhaps Jeremy Corbyn should add another proposal to his 'Change the Media' strategy to ensure that social media platforms provide a fair and balanced arena for political debate, rather than launching targeted blackouts that somehow don't affect mainstream media and pro-Tory pages?